GREAT Eastern Takaful Sdn Bhd has targeted to achieve RM180 million in new business premiums with the launch of i-Great Damai and i-Great Abadi, together with an education and retirement plan which will be introduced early next year. "With the launch of i-Great Damai & i-Great Abadi, I am confident that we will be able to achieve our total weighted new business premium target of RM180 million in 2011," its chief executive officer Mohamad Salihuddin Ahmad said at the launch of the products in Kuala Lumpur yesterday. Also present at the launch were its chief operating officer Elmie Aman Najas, appointed actuary Wong Kang Yuan, and its head of agency distribution Ariff Azhan Abd Ghani. 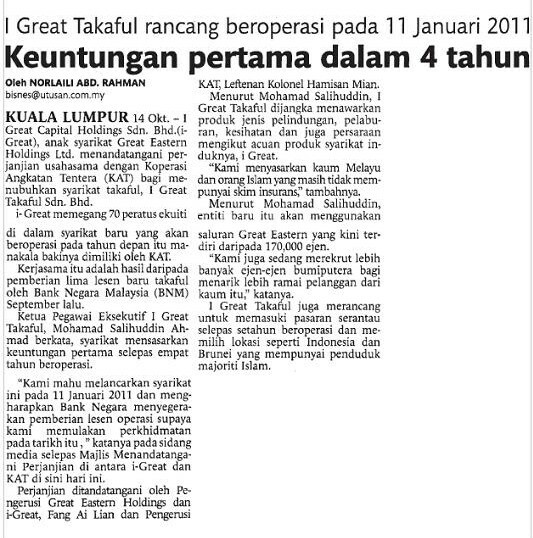 Great Eastern Takaful is a new joint-venture takaful unit formed by Great Eastern Holdings Ltd and Koperasi Angkatan Tentera Malaysia Bhd (KAT). The takaful operator will leverage on Great Eastern Life Assurance (Malaysia) Bhd's existing agency distribution channel of over 17,000 agents. Salihuddin said the company's immediate plan is to recruit more Bumiputera agents to further strengthen the agency infrastructure. Great Eastern Takaful currently has 5,000 qualifying takaful agents. Meanwhile, Salihuddin said the company's investment- linked family takaful product range consists of i-Great Damai, i-Great Abadi and nine attractive riders. He said i-Great Damai provides comprehensive protection with affordable contribution against the unexpected, while i-Great Abadi focuses on investing money to grow its customers wealth. i-Great Damai is a regular contribution plan with access to professionally managed investment funds with family takaful coverage and bereavement benefit of RM2,000 per person. On the other hand, i-Great Abadi optimises the investment portion with enhanced allocation of 2 per cent for every third contribution year, an investment concept with the attachment of provider rider.